As taping of the Top Affiliate Challenge winds down, we finally found some time to reward our hosts and crew with a special diner at Shogun Restaurant in Lincoln NE. Shogun is a Japanese style restaurant complete with open grills and chefs that prepare your food right in front of you with an artistic flare. In fact, that is where you would normally find me – eating at the grill. This time however, Monica Durazo and my wife Kim were encouraging me to try the sushi. I decided I would give it a shot. Call me a rookie, but I assumed that all sushi was raw fish. I was relieved to find out that was not the case at all. 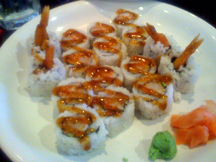 Wes Wyatt was there with us and he had a shrimp roll sushi that he insisted on dimming in wasabi sauce. Too hot for my tastes. The flavors were pretty interesting (aside from the wasabi) and overall I enjoyed the meal. I don’t think I will be eating sushi every week or anything, but it was definitely a nice change of pace from what I was used to. Overall we wanted to have really god food for the Top Affiliate Challenge contestants – lots of fruits and vegetables and variety. Not all sushi is raw fish…but all the GOOD sushi is. Maguro, Sake, Saba and Unagi are my favorites. Unagi is bbq freshwater eel. Maguro is a tuna, Sake is Salmon, Saba is mackerel which I find very tasty. Glad you liked it! I enjoy sushi from time to time. Where I live we really don’t have much good ethnic food. 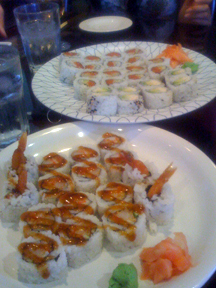 Mmmm Mmmm Mmmm – the Sushi was GREAT! But the company kept while eating it was even BETTER! Thank you again for a DYNAMITE night out!